Note: If you are printing through the Ethernet port it is important that you retrieve the parameter for the IP Address, Subnet Mask and Gateway from the old board before replacing it. To do so, please reference to the owner’s manual under section “Setting the IP Address on the Laser”. Don’t panic if your machine doesn’t boot up and you are unable to retrieve the parameters because we can get it from the computer. Give us a call after you complete installing the board, and we’ll walk you through getting the parameters. Turn the machine off. Make sure the power cord is disconnected from the wall outlet. Assuming you are facing the front of the machine, remove the panel on the right side to gain access to the main controller board. Use the #2 Phillips head screw driver to remove the 6 Phillips head screws, 4 of the screws are on the side and 2 in the back. Take the panel off and set it aside. With the panel out of place you should be able to see the controller board on the right side of the machine towards the rear. (Figure 1). 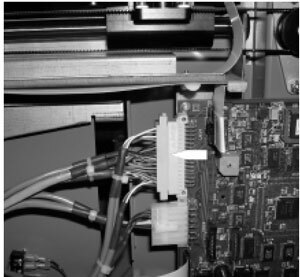 Depending on the type of connection you are using to print to the laser, you will need to either unplug the Ethernet cable or USB cable from the back of the engraver where it plugs into the controller board. Unplug the 4 connectors on the controller board mainly located along the left side if you are looking directly at it. Out of one of those 4 connectors, on the newer machines it will have a bracket with 2 Phillips head screws holding the connector in place to secure it to the board. If you have the newer machine, use a #1 Phillips head screw driver to remove the 2 Phillips head screws from the bracket so you can unplug the connecter. Look at figure 2 for reference. The older machine doesn’t have that bracket. 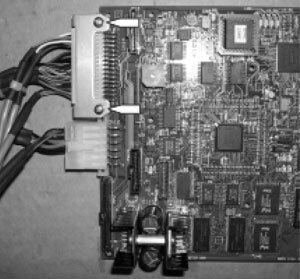 Remove the light grey in color connector located on the left side towards the top of the board. Please look at figure 3 for reference. Use the #1 Phillips head screw driver to remove the 4 Phillips head screws located on each corner of the board. The controller board can now be removed. 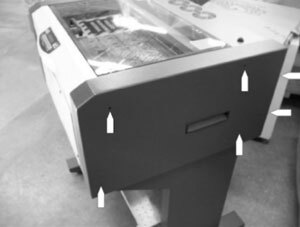 To install the new board, attach the grounding strap provided to your wrist and connect the other end to a screw somewhere on the chassis of the machine before handling the new controller board. Once you have this ground strap secure, reverse steps 7 back down to 1 to install the new controller board.